At the very top of the Saint Jacques tower, a fantastic point of view on Paris! 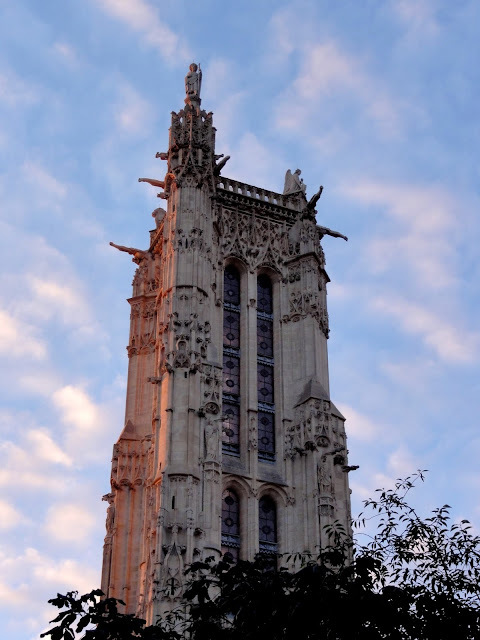 Don't miss the visit of the "Tour Saint-Jacques"! Exceptionally, the tower can be visit for a short period this summer, each weekend (Friday, Saturday and Sunday) until the 15th of September 2013. Even though the reservation starts at 9:30 AM, I recommend to be there early, before 7:00 AM, because the line can be long and only a limited number of persons will access (reservation only made for the day). It is worth the waiting time, the visit is interesting (in French but you will see interesting spots, pictures, the tower from the inside, etc.) and the view at the top is amazing! You are at the center of Paris, in the middle of the sky! Well, if you can't go there, have a look to the following 360° video (not the best, maybe, but with many labels explaining which are the monuments and buildings). The video will stop many times to let you read these labels. If you want more time to read them, you can pause the video. Très beau panorama ! On voit tout Paris ! Bravo ! Paris is beautiful from it's every nook and every corner. This city has more life in it more than any other city in the world. There are many cultural attractions in Paris with high class artistic galleys. Recently i have been to Paris, and the thing which attracts me the most is the Parisian architecture in old middle aged buildings. Doing these type of amazing things are my passion and i love to see Paris from height. When i go to Paris next year then definitely doing all the crazy things with my friends. Because my thoughts are life without enjoyment is such a waste and this is the great thing to get risk of life! !